In peripheral tissues, particularly liver, GH appears to regulate the abundance of its own receptors. Acutely, GH downregulates GH binding sites in the liver (33). Chronic treatment increases hepatic GH binding (34), although this requires continuous rather than intermittent GH replacement (35). It is not clear whether GHRs in the CNS are sensitive to different patterns of GH quite separately from their effects on growth. Differential sensitivity to different aspects of the GH secretory pattern has been clearly shown for hepatic receptors in GH-deficient rats (36), but it is doubtful whether such pattern sensitivities can be maintained to targets that lie behind a blood-brain barrier, which would certainly dampen, if not prevent, CNS exposure to rapid fluctuations in plasma GH. 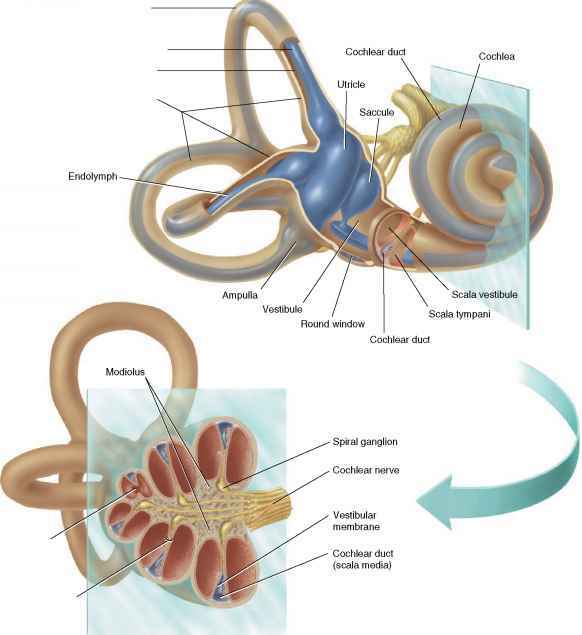 However, conversely, it may be that only the high plasma concentrations attained by secretory pulses of GH will enable sufficient GH to traverse these barriers to stimulate GHRs in some regions of the CNS. Following hypophysectomy, GHR expression varies in a tissue-specific manner. For example, GHR transcripts have been shown to increase in muscle (37), increase or remain unchanged in liver (13,37), and decrease in the ovary (38) and adipose tissue (37). 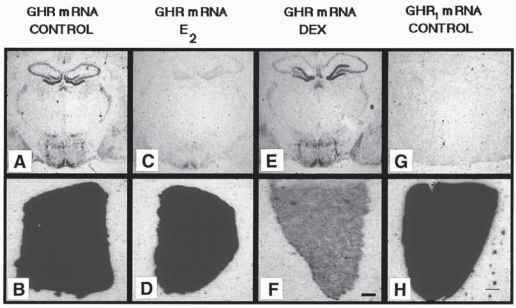 Central GHR expression is also sensitive to regulation by GH. Hypothalamic GHR expression decreases in hypophysectomy or in dwarf rats with specific Gh deficiency, and is restored by treating them with exogenous GH (Fig. 3) (39,40). Fig. 4. In situ hybridization histochemistry for GH receptor mRNA in brain and liver of normal rats (A,B), rats given estradiol for 14 d, (C,D), or given dexamethasone 14 d (E,F). Note the reduction in signal intensity with estradiol in brain, but not liver, and the reduction in GH receptor with dexamethasone in liver, but not brain. In situ hybridization with a probe specific for transcripts containing the GHRj 5'UTR shows prominent expression in liver (G), but no expression in brain (H). Redrawn from ref. 47.
autofeedback loop by which GH regulates its own secretion and action, both peripherally and in the CNS (40,42).